I think that if there's one thing in life that we would all like, it's to be really good at one thing, and if possible, be acknowledged for that thing. It doesn't even have to be a special talent -- just that one skill which we've truly mastered. For over a decade, Adam McKay has proven himself to be a master of making comedic films. Through his partnership with Will Ferrell, McKay brought us movies like Anchorman, Talladega Nights, and Step Brothers. These films show a penchant for silly surrealism, and McKay clearly isn't afraid for things to get totally bonkers. McKay could have easily kept making comedies and enjoyed his career. Instead, he turned his attention to an incredibly serious drama and, with The Big Short, proved that he's not just a funny guy. The Big Short opens in the mid-2000s, a time when the U.S. economy seemed very stable. Dr. Michael Burry (Christian Bale), a former medical doctor who runs an investment capital firm, begins to notice trends in the housing market and concludes that many mortgages will go into default and destroy the real estate industry. He approaches all of the major banks and buys mortgage "swaps", essentially betting against the housing market. Assuming that this market can never fail, the banks are more than glad to take his money. Jared Vennett (Ryan Gosling) gets wind of this, and a wrong number call places him in touch with Mark Baum (Steve Carell) who runs a small firm called FrontPoint Partners. Vennett presents this radical idea of Baum and his team, and they soon find themselves buying these "swaps". Young investors Charlie Geller (John Magaro) and Jamie Shipley (Finn Wittrock) have come to New York to try to get into the game, when they hear of these "swaps" and try their hand at it. Soon, all of these individuals will begin to monitor the economy with mixed feelings because, if they win, millions of people lose. It's one thing to not understand a movie because it's overly vague (which is usually labeled as "artsy") or because it's sloppily edited and makes no sense. But, The Big Short is one of those movies which I had a difficult time grasping because it seemed to be taking place in an alien world. Narrator Jared Vennett states that Wall Street makes things confusing on purpose in order to convince laymen that only an expert can succeed in the financial world. Despite the fact that the actually stops at times to explain some of the terminology and utilizes on-screen graphics to achieve this as well, a lot of the details went completely over my head. However, this did not stop me from grasping the gist of the story and being completely blown away by The Big Short for two reasons. First of all, the story here is incredibly important and it's something which every American should try and understand. Briefly, banks were granting mortgages to home-buyers who really should not have qualified, not caring that these individuals could lose their houses -- the banks would end up getting their money one way or another. The problem is that so many of these bad loans were granted that the entire industry turned upside-down and when a sizable percentage of mortgages were not getting paid, the banks were suddenly in trouble. By finding loopholes and being very unethical, many people made a lot of money preying on people who simply wanted to own a house. It's incredibly scary that this happened and that it almost destroyed the U.S. economy. The movie makes you think twice about any large investment, but it also shows how heartless people can be when money is involved. The other noteworthy part of The Big Short is the movie itself and the fantastic job with Adam McKay has done. In the hands of many directors, the material here would have been very dry and boring. Due to his background making decidedly reckless movies, McKay has brought a completely different attitude to the material. As noted above, the movie uses very creative techniques to explain the more technical parts of the story. Characters break the fourth wall, addressing the audience directly, even pointing out areas where dramatic license was taken with the story. The first half of the film features montages which show events from the popular culture of the time. McKay does this to point out how Americans focus on trivial matters while crooks rob us blind. This may be the most sobering part of the movie. Overall, the tight editing and creative choices make The Big Short tick and McKay clearly deserved his Oscar nod. The cast also gives the movie a huge boost. Bale is excellent as Burry, a man who has the tendencies of a person with Asperger Syndrome, and it's admirable how the usually volatile Bale dials it down. Conversely, Carell plays a man who is a hothead and can lose his temper very quickly due to the powerful emotions which he's attempting to keep inside. Gosling brings the right amount of arrogance to his role, and seems to be more energetic than usual. The movie also has some nice cameos, with some famous faces appearing for just a moment. 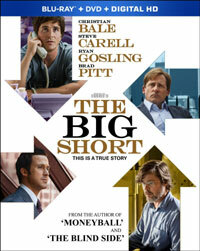 The sum total of this is that The Big Short is that rare film which can take a very eye-opening real world story, but present it in a way which is entertaining and bewitching. You'll watch to the end and come away admiring the movie and feeling very, very afraid. The Big Short mentions my hometown on Blu-ray Disc courtesy of Paramount Home Entertainment. The film has been letterboxed at 2.35:1 and the Disc contains an AVC 1080p HD transfer which runs at an average of 25 Mbps. The image is very sharp and clear, showing no overt grain and no defects from the source materials. The colors look good, although there are some muted tones here, and the image is never overly dark or bright. The level of detail is good, as we can make out the textures on objects, and the depth is adequate. The Disc carries a DTS-HD Master Audio 7.1 track which runs at 48 kHz and an average of 6.0 Mbps. The track provides clear dialogue and sound effects. Being a drama, the dialogue is of the utmost importance here, and it sounds fine. The track also takes advantage of crowd scenes, offering distinct sounds from the front and rear channels, as well as some bass-heavy music which certainly gets the subwoofer involved. The Big Short Blu-ray Disc contains an assortment of extras. "In the Tranches: Casting" (16 minutes) examines each of the main characters one-by-one, which includes comments from the actors. McKay and other members of the creative team give input into how the casting process progressed and how each actor fit the role. "The Big Leap: Adam McKay" (12 minutes) looks at how the comedy director was able to fulfill his dream of adapting this book that he loved. "Unlikely Heroes: The Characters of The Big Short" (11 minutes) basically gives an overview of the plot, while examining the characters. This does includes appearances by some of the real-life people and author Michael Lewis. "The House of Cards: The Rise of the Fall" (14 minutes) shows the lengths that film went through to bring the economic terminology and history to forefront, while also making it digestible. "Getting Real: Recreating an Era" (11 minutes) breaks down the cinematography and the efforts made to create a period film which is examining a period from just a few years ago. The Disc contains five DELETED SCENES which run about 6 minutes. These include a sub-plot with Burry's son and an appearance by one of the real-life characters.